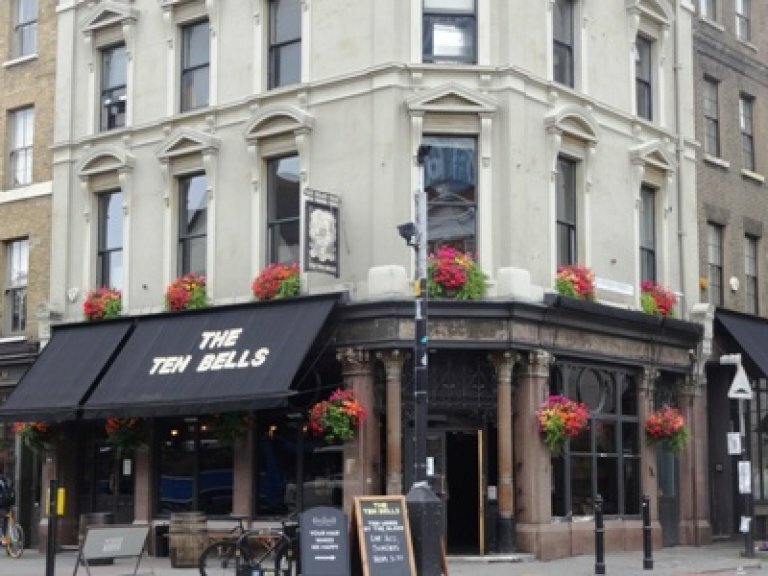 The Ten Bells is also on the Regional Inventory where the description is as follows: “A four-storey corner pub right opposite the magnificent Christ Church, Spitalfields, and Spitalfields Market. The outside could do with a little sprucing up but at least it retains the insignia of the former owners, the major brewers, Truman, Hanbury and Buxton who operated from Brick Lane nearby. The interior has been gutted to make a smart bar but the pub is included here for its first-rate wall tiling of around 1900. On the left, just inside what would have been an entrance corridor, is a tiled mural entitled ‘Spitalfields in ye Olden Time – Visiting a Weaver’s Shop’. Here we have a prosperous-looking lady and gent (complete with young black servant) surrounded by deferential locals, inspecting a piece of cloth. Spitalfields was a centre of the silk-weaving industry established by Huguenots. The mural is signed ‘W. B. Simpson & Sons. 100. S. Martins Lane. LONDON’. Simpson’s were responsible for a great many tiling schemes in pubs a century or so ago. Otherwise there are large tiled panels with swirling blue and white Arabesque decoration. The Ten Bells featured on the Evening Crawl of EC2, EC3 and EC4 in December 2003, the Daytime Crawl of SW Essex and E London in June 2006, and was a "try also" on the Breweries and Markets Past and Present: Evening Crawl of Shoreditch, Bethnal Green and Spitalfields in December 2009.